RIA-T3-ST kit is intended for quantitative determination of triiodothyronine in human serum or blood plasma by radioimmunoassay method. Quantitative determination of triiodothyronine is necessary for diagnostics and control of treatment of thyroid gland dysfunctions. RIA-T3-ST kit is designed for analysis in duplicates of 42 unknown samples, 1 control sample and 6 calibrators, and 1 sample of [125I]-triiodothyronine total activity. RIA-T3-free kit is intended for quantitative determination of free T3 in human serum of the person by radioimmunoassay method. Quantitative determination of a free triiodothyronine most significantly reflects the thyroid gland status. Its increased concentration reveals at central or peripheral hyperthyroidism. Decrease of free triiodothyronine level is observed at hypothyroidism. RIA-T3-free kit is designed for analysis in duplicates of 42 unknown samples, 2 control sample and 5 calibrators, and 1 sample of [125I]-monoclonal antibodies to T4 total activity, 100 measurements in total. RIA-T4-ST kit is intended for determination of thyroxine in human serum or blood plasma by radioimmunoassay method. Quantitative determination of thyroxine is necessary for diagnostics and control of treatment of thyroid gland dysfunctions. RIA-T4-ST kit is designed for analysis in duplicates of 42 unknown samples, 1 control sample and 6 calibrators, and 1 sample of [125I]- thyroxin total activity. RIA-T4-free kit intended for quantitative determination of free thyroxine in human serum of the person by radioimmunoassay method. Quantitative determination of a free thyroxine most significantly reflects the thyroid gland status. Its insreased concentration reveals at central or peripheral hyperthyroidism. Decrease of free thyroxine level is oseved at hypothyroidism. RIA-T4-free kit is designed for analysis in duplicates of 43 unknown samples, 1 control sample and 6 calibrators, and 1 sample of [125I]- monoclonal antibodies to T4 total activity, 100 measurements in total. IRMA-TG-ST kit is intended for determination of thyreoglobulin (TG)concentration in human serum or blood plasma by immunoradiometric assay method. In clinic the determination of TG level by means of IRMA-TG-ST kit can be used for early detection of relapses and metastases high differentiated thyroid gland cancer in operated patients (determination of TG level cannot be applied for pre-surgical differential diagnostics of benign and malignant thyroid gland tumors), for efficiency assessment of metastases radio-therapy of thyroid gland cancer, for estimation of thyrotoxicosis severity level and for control of treatment efficiency. The IRMA-TG-ST kit is designed for analysis in duplicates of 40 unknown samples, 2 control samples and 7 calibrators. and also 1 sample of [125I]-monoclonal antibodies total activity to TG. IRMA-ANTI-TG-ST kit is intended for determination of concentration of autoantibodies to thyreoglobulin (anti-TG) in human serum or blood plasma by immunoradiometric assay method.Quanttitative anti-TG determination is necessary for diagnostics and control of treatment of autoimmune thyroid diseases-thyroiditis Hashimoto, idiopathic myxedema, diffuse toxic goiter. IRMA-ANTI-TG-ST kit is designed for analysis in duplicates of 42 unknown samples, 1 control sample and 6 calibrators, and also 1 sample of [125I]-protein A total activity. IRMA-TSH-ST kit is intended for determination of thyroid-stimulating hormone (TSH) concentration in human serum or blood plasma by immunoradiometric assay method. Quantitative determination of TSH most significantly reflects the thyroid gland status. Measurement of its concentration in blood is of great importance for diagnostics and monitiring of disturbances in a system "hypophysis - thyroid gland". The IRMA-TSH-ST kit is designed for analysis in duplicates of 40 unknown samples, 2 control samples and 7 calibrators, and 1 sample of [125I]-monoclonal antibodies total activity to TTG, 100 measurements in total. IRMA-ANTI-TPO-ST kit is intended for determinantion of concentration of autoantibodies to thyroid peroxidase (anti-TPO) in human serum by method of immunoradiometric assay. Quantitative determination of autoantibodies to thyroid peroxidase can be used for diagnostics of all forms of thyroid gland autoimmune diseases: thyroiditis Hashimoto, idiopathic myxedema, chronic atrophic thyroiditis, Graves disease. Autoantibodies against TPO can be detected also in patients with thyroid gland adenoma and cancer. 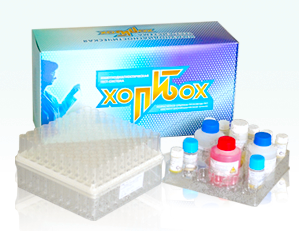 The kit is designed for analysis in duplicates of 42 unknown samples, 1 control sample and 6 calibrators, 1 sample of [125I]-Protein A total activity (100 measurements in total). RIA-TESTOSTERONE-ST kit is intended for quantitative determination of testosterone in human serum by radioimmunoassay method. Quantitative testosterone determination is necessary for diagnostics and control at tratment of reproductive system dysfunctions. RIA-TESTOSTERONE-ST kit is designed for analysis in duplicates of 42 unknown samples, 1 control sample and 6 calibrators, 1 sample of [125I]-testosterone total activity. RIA-PROGESTERONE-ST kit is intended for quantitative determination of progesterone in human serum by radioimmunoassay method. Quantitative progesterone determination is necessary for diagnostics and control at treatment of reprodyctive system dysfunctions. RIA-PROGESTERONE-ST kit is designed for analysis in duplicates of 42 unknown sample, 1 control sample and 6 calibrators, 1 sample of [125I]-progesterone total activity. RIA-ESTRADIOL-ST kit is intended for quantitative determination of estradiol in human serum by radioimmunoassay method. Quantitative estradiol determination is necessary for diagnostics and control at treatment of reproductive system dysfunctions. RIA-ESTRADIOL-ST kit is designed for analysis in duplicates of 42 unknown samples, 1 control sample and 6 calibrators, 1 sample of [125I] - estradiol totl activity. RIA-CORTISOL-ST kit is intended for quantitative determination of cortisol in human by radioimmunoassay method. Quantitative determination of cortisol is necessary for diagnostics of disturbances in hypothalamus-hypophysis - adrenal cortex system ana for control of medical actions efficacy. RIA-CORTISOL-ST kit is designed for analysis in duplicates of 42 unknown samples, 1 control sample and 6 calibrators, and 1 sample of [125I]- cortisol total activity. IRMA-PSA-ST kit is intended for in vitro determination of concentration of total prostate specific antigen (PSA) in human serum by method of immunoradiometric assay. Quantitative determination of prostate specific antigen most significantly reflects prostate gland status. The increase in PSA concentration is characteristic for prostate malignant neoplasm and its metastasizes in bones, and also is detected in patients with prostate benign hyperplasia (PDH. Routine measurements of PSA level play an important role in monitoring of prostate cancer patients condition during treatment and remission. PSA total IRMA KIT is designed for analysis in duplicates of 43 unknown samples, 1 control sample and 6 calibrators, 100 measurements in total. IRMA-PSA free-ST kit is intended for in vitro detrmination of free prostate specific antigen (PSA) in human serum by method of immunoradiometric assay. At determination of free and total PSA it has been shown in variety of studies, that free PSA costitutes considerably smaller fraction in patients with untreated prostate cancer in comparison with prostate benign hyperplasia. As a result of this the ratio of free PSA to total PSA is recommeneded to use as differential and diagnostic criterion between prostate cancer and prostate benign hyperplasia. PSA free IRMA KIT is designed for analysis in duplicates of 43 unknown samples, 1 control sample and 6 calibrators, 100 measurements in total. IRMA-LH-ST kit is intended for determination of luteinizing hormone LH)concentration in human sarum or blood plasma by immunoradiometric assay method (IRMA). Quantitative determination of LH is necessary for revealing of disorders at examination of anomalies of a sexual development, the causes of sterility and disorders of menstrual cycle. LH is a glicoprotein with molecular mass approx. 28 kDa,secreted by gonadotrophic cells of anterior lobe of pituitary gland. In women LH stimulates ovulation and yellow body formation, in men - secretion of testosterone by cells Leydigs. LH secretion by pituitary gland is stimulated by hypothalamic decapeptide - gonadotropin regulatory hormone. IRMA-FSH-ST kit is intended for determination of follicle-stimulating hormone (FSH) cocentration in human serum or blood plasma by immunoradiometric assay method (IRMA). Quantitative determination of FSH is necessary for revealing of disorders at examination of anomalies of a sexual development, the causes of sterelity and disorders of menstrual cycle. FSH is a glicoprotein with molecular mass approx. 30 kDa, secreted by gonadotrophic cells of anterior lobe of pituitary gland. FSH stimulates maturing of follicles and spermatogenesis. FSH secretion by pituitary gland is stimulated by hypothalamic decapeptide - gonadotropin regulatory hormone. The kit is designed for analysis in duplicates of 42 unknown samples, 1 control sample and 7 calibrators, 100 measurements in total. IRMA-PROLACTIN-ST kit is intended for quantitative determination of prolactin in human serum or blood plasma by immunoradiometric assay method. Quantitative determination of prolactin is used for diagnostics of various endocrine disturbances: functional sterelity, lactation disorder, galactorrhea and amenorrhea syndromes. Hyperprolactinemia is observed and is case of medical preparations intake and substances of psychophysical action.